Feiwel & Friends, 9780312375577, 368pp. The summer before Troy Stotts turns seventeen, his mother dies. Troy and his father barely speak, communicating instead by writing notes on a legal pad by the phone. Troy spends most of his time with his closest friends: Tom Buller, brash and fearless, the son of a drunk; Gabe Benavidez, smart enough to know he’ll never take over the family ranch; and Gabe’s sister, Luz, whose family overprotects her, and who Troy has loved since they were children. Troy and his friends don’t want trouble. 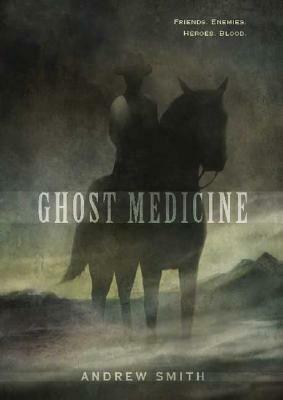 They want this to be the summer of what Troy calls “ghost medicine,” when time seems to stop, so they won’t have to face the past or the future. But before the summer is over, their paths will cross in dangerous and fateful ways with people who will change their lives: Rose, a damaged derelict who lives with a flock of wild horses and goats; and Chase Rutledge, the arrogant sheriff’s son. Andrew Smith is the author of "The Marbury Lens," named an American Library Association Best Book for Young Adults, and "In the Path of Falling Objects." In addition to writing, he teaches high school advanced placement classes and coaches rugby. He lives in Southern California with his family, in a rural location in the mountains.